On Tuesday, news broke about another black man being fatally shot by the police. In Charlotte, North Carolina, a disabled black man, Keith Lamont Scott, was shot and killed by police. His death comes after a shooting of an unarmed black man, Terence Crutcher, in Oklahoma within the same week. Scott's death sparked widespread protests in Charlotte, with Wednesday being the second day of demonstrations. According to WCNC, police were looking for someone with an outstanding warrant outside a complex when they saw Scott leaving his car with a gun. Local reports state Scott was shot and killed by officer Brentley Vinson with a police report claiming that Scott was armed. But witnesses on the scene disagree with the police, alleging that Scott was unarmed. Scott's family has spoken out, arguing that he was waiting to pick up his son and reading a book in his car when the police approached him. There are clear discrepancies between police and local witness reports regarding what happened, but Scott's death marks another troubling instance of growing racial bias in police surveillance and brutality, and because of that, the streets of Charlotte have been flooded with protesters. In the chaos of the protests, nine civilians have been injured with 44 arrested during the Wednesday night riots. One person, after being shot, remains in critical condition. Over both Tuesday and Wednesday, 16 officers have been reported injured in their clash with the protesters. The violence escalated on Wednesday night and CBS News reported that the governor has ordered the National Guard to come to Charlotte for additional assistance. Images from the scene show the destruction in Charlotte so far as hundreds of protesters gathered downtown. 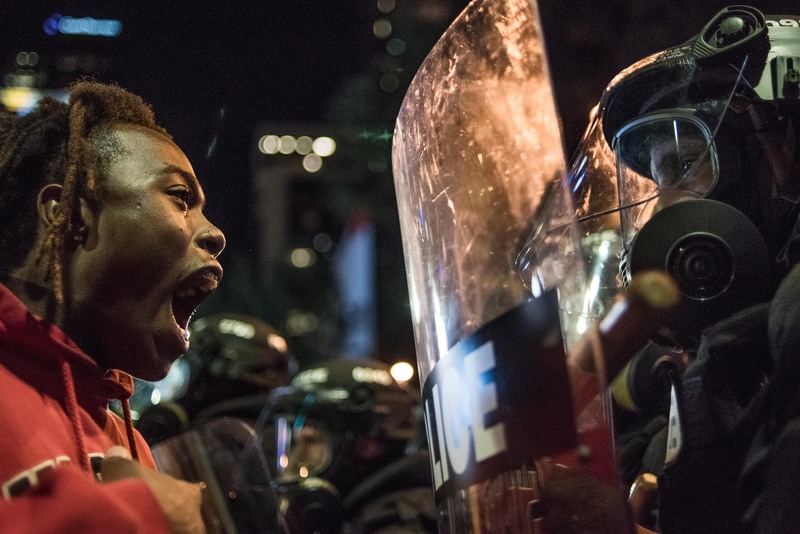 Business Insider reported that police used tear gas and rubber bullets to try and disperse protesters outside the Omni Charlotte Hotel as they used fireworks against the officers. "The whole reason we had to protest was because somebody was shot unarmed. Another unarmed person is shot today," protester Gloria Merriweather said to CBS News, contesting the police claim that Scott was armed. The fatal shooting of Scott is the 214th of a black person by U.S. police this year, according to data from the Mapping Police Violence. Overall, 821 black people have been killed by police brutality. As people waited for the release of footage of the police encounter with Scott, Charlotte-Mecklenburg Police Chief Kerr Putney said that Scott's family will be the only ones to see the video. It is still unclear if the Federal Justice Department will be investigating Scott's death, but in a statement, his wife, Rakeyia Scott, asked for an end to the violence as they wait for more answers regarding the circumstances of his death. Until then, it's likely that people will continue protesting Scott's death (and the countless deaths of fellow black Americans) in Charlotte.